The Swiss Alps are legendary for Alpine skiing, extraordinary scenery and authentic chalets for lodging, dining and après ski. Here are a few of the best ski hotels in Switzerland’s Alps, four and five star places to stay located right on the slopes for your next Swiss luxury ski vacation. Verbier is a very chic ski village, a party town and playground for the wealthy and wild – the ski terrain here is pretty extreme and steep. Among Verbier’s hotels and chalets, the Chalet de Flore is four star and offers beautiful suites with mountain views, conveniently located near the lifts and the village shops, dining and après ski. 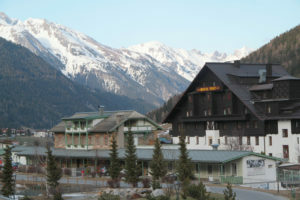 Its sister hotel is the 5 star Chalet D’Adrian. Verbier’s No. 14 Chalet and The Lodge Verbier, owned by Sir Richard Branson of Virgin Atlantic, also get high marks for mountain hotels. The Hotel W Verbier, W Hotel’s first ski hotel and first Swiss W Hotel, is a prime place to stay – The W has an authentic alpine exterior yet its uber posh 5-star inside, located in the Place Blanche at the base of Verbier’s ski lifts. Zermatt has over 120 fine ski hotels, all walking distance to Zermatt’s ski lifts in this car free ski village. 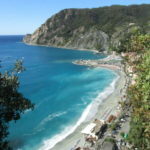 The Cervo is the ultimate chic alpine hotel, located at the base of the Sunnegga slopes. Cervo is also THE Place to be and be seen at après ski, so you are styling where the cool kids party after skiing, but your suite is quiet and sophisticated come evening. The Suitenhotel Zurbriggen Zermatt is a modern minimalist style hotel and spa, owned by famed Swiss ski racer Pirmin Zurbriggen. Stay on mountain at Zermatt, The Riffelalp Resort at mid mountain and The Kulmhotel at the summit are both high above town reached by the Gornnergrat train. You can also stay in an igloo on the ski slopes at Zermatt’s Iglu Dorf – how cool is that! 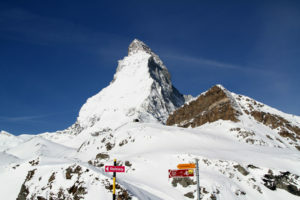 See our review of skiing Zermatt. Portes Du Soleil is a vast ski region connectign 12 village, in both the Swiss and French Alps. 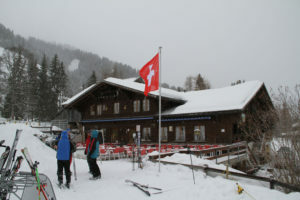 Our favorite place to stay is in Les Crosets, Switzerland, a small ski village, at The Mountain Lodge. From this modern but cozy on slope ski lodge, you are step to the lifts, and après ski provides a jacuzzi, steam room, Cinema, fireside bar, and delicious homemade dinner and breakfast – included in your stay. Our Mountain Lodge balcony in the beautiful chalet lodge afforded a great view of night skiing and the Dents Du Midi – the striking Alps peaks that frame Portes Du Soleil’s tremendous skiing. Saas Fee is a romantic and relatively small ski village near Zermatt. This car free village ski resort town has just enough snow-laden alpine chalets for lodging its guests, nowhere near as busy as Zermatt. The Dom Hotel is our fave in Saas Fee, named for the 14,911′ peak, this grand four star hotel in the center of the ski village is modern and minimal alpine in design, with the best creature comforts and electronics – ipads, plus the Dom Bar downstairs for après ski, and the Winecellar 1881 for haute cuisine. Wengen is the crown jewel of the Jungrfrau region in Switzerland, in the heart of the skiing at Grindelwald, Wengen and Murren – where you’ll find the Schilthorn and the Piz Gloria revolving 360 restaurant James Bond made famous. Wengen’s car-free ski village is historic and happening, especially during the World Cup race on the Lauberhorn. The 1894 Hotel Regina is a classic, old-world regal hotel perched on Wengen’s hillside, a short walk to town, the ski shops, bars, and train station. Rooms are old-fashioned, traditional, skier comforts in the hotel include a ski room, and a bountiful breakfast, plus a hearty prixe fixe dinner in the grand dining room. Après ski drinks in the Swiss décor piano bar are a flash from the past. 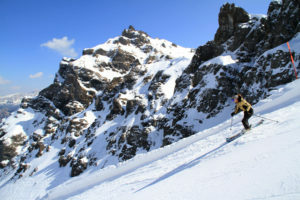 Ski Lodge Engelberg, while not a luxury hotel – is also not stuffy or sophisticated, its lively, casual and fun for skiers, perfect after skiing the Titlus Glacier and Engleberg’s beautiful ski slopes. This Swedish-owned hotel has great après ski, an outdoor hot tub and Sauna, ski room with boot dryers, modest comfy rooms, and serves a bountiful breakfast buffet well before lift opening in the pretty mountain village of Engelberg. The balcony views of Mt Titlis, Spannort and Hahnen are impressive as well, and you are steps to the Train station and ski bus, and the 11th century Monastery where they make cheese.